Paloma and the Horse Traders ($14.95, 256 pp., ISBN: 978-1-60381-990-9), is book 3 of Carla Kelly’s historical romance series, The Spanish Brand. As with books 1 and 2, The Double Cross and Marco and the Devil’s Bargain, this novel takes place at the end of the 18th century during the decline of the Spanish Empire in the New World. A brand inspector and his wife face a new threat to their ranch when a renegade Comanche begins to wreak havoc in the vicinity, putting a tentative truce in jeopardy. On their way to a final showdown, they gather together a ragtag army that includes some unlikely allies and a ghost from Paloma’s past. “I am totally captivated by this series. Marco and Paloma have formed such a strong love, that it’s breathtaking. The descriptions of the characters and places are vivid. The plot is riveting and the action is exciting. I am totally invested in this couple, and I’m thrilled to hear that there is at least one more book coming in the series. I would recommend reading the first two books of this series to get the maximum enjoyment. Paloma and the Horse Traders is pure artistry and a sheer delight. I give it my highest recommendation.” Read more…. “Set in the 18th century in what is today New Mexico, the novel is much more than a romance. It is, in fact, a rousing and exciting Western that will appeal to all readers…. Kelly knows her subject matter; her historical research is impeccable. But her research never gets in the way of her spinning a good yarn. This is a great read, and it is highly recommended.” Read more…. “A friend encouraged me to read this series of books, and, at first, I was reluctant to do so. I have read and loved Carla Kelly’s regency romances and historical romances, but New Mexico in the 1700’s? Hostile Comanches? Uncivilized living? Not for me, I thought. Boy, was I wrong! This is truly some of the best historical fiction I have read…. The Spanish Brand Series weaves a lot of historical information into Marco’s and Paloma’s love story. Carla Kelly doesn’t shy away from the harsher aspects of life, yet these stories are fast paced and exciting and beautiful. There is subtle humor as well, the kind I enjoy, humor that doesn’t hit you over the head, but nibbles at you, causing you to smile. Every book here is a winner, and a keeper. All receive my highest recommendation.” Read more…. 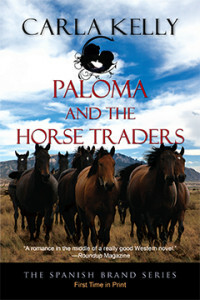 “Carla Kelly proves a later book in a series can outshine its predecessors with Paloma and the Horse Traders. Bringing back the authenticity of the old Spanish West and the hacienda of Marco and Paloma while introducing additional enemies and newfound friends, Kelly turns Paloma and the Horse Traders into a must-read…. Marco and Paloma open their hearts and their home to a cast of characters that bring smiles, tears and life-changing surprises and revelations in this series set at the end of the 18th century.” Read more…. The first two books in this series were enthusiastically received by the critics. “Life at this time was hard and unpredictable, and this beautiful love story interwoven with history makes for an outstanding read.” wrote Lady Blue in Romantic Historical Reviews of The Double Cross, making it a 5 Star Top Pick. A well-known veteran of romance writing, Carla Kelly is the author of thirty-five novels, numerous short stories, and four non-fiction works. Carla enjoys writing historical fiction, which she sees as a byproduct of her study of history. In addition to her works centered on the American West, she has written many books featuring the Royal Navy during the Napoleonic Wars. Click here to find Carla online. “What do you see?” Paloma asked, after a pause that seemed to stretch for hours. Paloma did as she said, bowing her head over her darlings, keeping them silent. She wished that Marco was there to wrap his comforting bulk around the three of them. Calmly, she tucked the foolish wish away and prepared to fight to the death for her children. Eckapeta was too silent. “Tell me what you see,” Paloma pleaded. She could have screamed with the silence, but she only clenched her jaw tighter. Claudio began to whimper, so she opened her bodice and nursed him; weaning could wait. He suckled and was comforted, while Soledad burrowed closer. Paloma closed her eyes, remembering blessed moments of nearly four years, moments that would never have been hers, if Marco Mondragón had not ridden to Santa Fe to take his yearly records to the governor, and gone in search of a little dog to keep his feet warm at night. If this was all the joy she would know, it was better than none at all. She thanked El Padre Celestial for his kindness to her and put her terror away, too. Silent, Paloma picked up Claudio and ran with him to her horse, Eckapeta close behind with Soledad in her arms. The Comanche woman helped Paloma put the cradleboard on her back again, stuffed in Claudio, then heaved them onto Paloma’s horse with no fanfare. Eckapeta handed up Soledad next and Paloma seated the little one firmly in front of her. Paloma jammed her heels into her normally sedate mare, which started in surprise at such unexpected treatment from her mistress. She was not a speedy horse, but maybe she sensed trouble. Perhaps she smelled strange horses. Whatever the reason, the mare shot away from the bosque and thundered toward the place where the road forked toward the Double Cross. “Fun, Mama!” Soledad said as she leaned back against Paloma, enjoying the wind in her baby-fine hair. “Yes, fun,” Paloma said as she crouched lower in the saddle, wishing she could turn herself into a Comanche rider. Her skirts billowed well above her thighs. She knew Marco would tease her if he were here, but he was not, so she struggled to keep her tears inside.